On Christmas Day, Brogan hit a tree with his face while sledding. If you missed that exciting episode, you can read up on it here. Thankfully, there were no broken bones, just extensive swelling and bruising....a several teeth knocked loose. A little over one month later his scrapes have healed and his bruises have finally gone away. This week a tooth joined the injury exodus, much to Brogan's delight! If you're looking for drama and exciting details, well, there's none to be had. We've no idea when the tooth fell out or where it went. We just know it's gone. 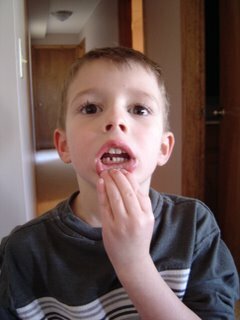 M. had been in Boston and upon his return he took one look at Brogan and asked, "Did he lose a tooth?" Turns out he did! And the one next to it looks like it won't be hanging around much longer. Tonight the "Tooth Daddy" will pay his first visit. Brogan is looking forward the beginning of this very lucrative relationship. what exactly is the "Tooth Daddy"? Lori, a Tooth Daddy replaces a tooth when the Sugar Daddy steals one. BWAHAHA! Pual, that's hilarious! I'm going to remember that! I hope you're feeling back to normal again! I laughed that you noticed under my couch. I thought the same thing after I looked at the picture ~ kinda surprising! My husband has been doing the vacuuming lately.